Please Note: Do not include any personal information in your message--beyond the mandatory areas below marked with an asterisk (*). We will collect all additional information when we contact you. Take the E VALLEY ROAD exit toward SW 43rd Street.Stay in the RIGHT lane when exiting. At the traffic light at E VALLEY ROAD, go straight on to SW 41st ST and proceed to the traffic light at LIND AVE SW. 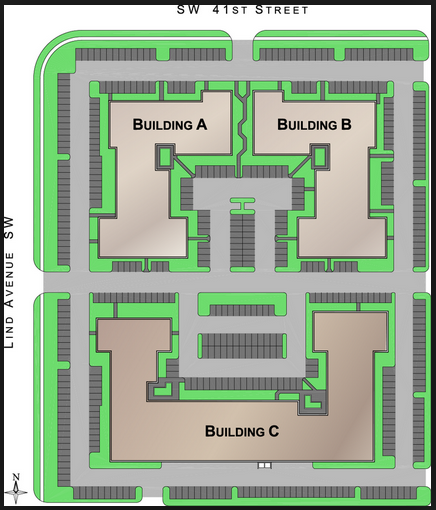 When entering the office park, the building on your LEFT has a sign for NEWTON LABS.We are in the 2ND office building (Building B) located behind the NEWTON LABS building.Look for our sign on the outside of our building.We are in suite 403. From Issaquah:Take I-90 heading to Seattle.Merge on to I-405 South at Exit 10 heading towards Renton. Take the E VALLEY RD exit toward SW 43rd ST.Stay in the RIGHT lane when exiting. At the traffic light, go straight on to SW 41st ST and proceed to the traffic light at LIND AVE SW.
At the traffic light, turn LEFT.Drive about 200 feet and turn LEFT into the driveway to enter the SOUTH LIND SQUARE office park. Take WA-167 N heading towards Renton. 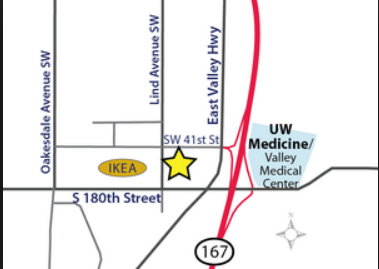 Take the exit for S 180th ST / SW 43rd ST.
At the traffic light facing the Valley Medical Center complex, turn LEFT on to S 180th ST / SW 43rd ST.
At the 1ST traffic light at E VALLEY RD, continue through the intersection to the next traffic light at S 180th ST / SW 43rd ST and LIND AVE SW. Turn RIGHT on to LIND AVE SW.Continue on LIND AVE SW until you see the driveway on your RIGHT to enter the SOUTH LIND SQUARE office park.